The retreat at the cabin was blissful. Too short, but blissful nonetheless. The cabin had these huge windows, 5×5 maybe. The days were sunny, and the light glorious. I hunted through books and printed then traced, enlarged, sketched, and generally had a glorious time. The piece I was super excited about was the octopus. Sadly, I just couldn’t get anything on paper that I really liked. I ended up with one sketch, but realized that in order to make it as detailed as I wanted, it would have to be HUGE. All those suckers and swirling arms… It defeated me, for now. Not ready to work on a 500 piece window. Very happy with the breaching whale. I wanted something fluid and curving and joyful. I think I got it. there we go!! Its all cut and ground and fitted together now. The water I did in a sapphire blue streaky, teal streaky and a milky seafoam green/ cream/white textured glass. The whale is grey, and his underbelly is a mottled white and grey. As usual, I cannot wait to see it up and lit. But will have to. Too many things going on. Probably have it done in another couple weeks. The jellyfish turned out awesome, too. Really really happy with it. 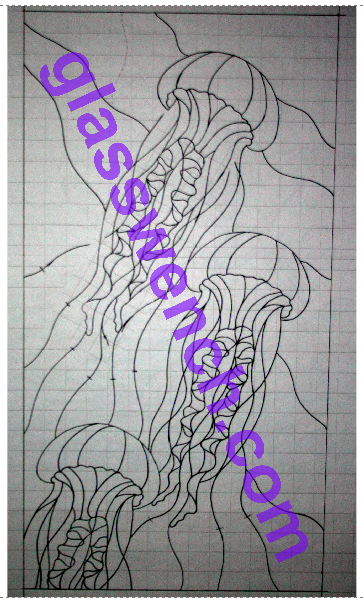 It’ll be a monster, lots of little pieces, x3, cuz there are three jellyfish… but they will be gorgeous when done. Going to use a pale irridescent pink, peach, and pink/purple for caps and inner bits. I have super pale transluscents for the fill. Purchased some great textured glass for the background. Teals and blues again, with bubbles and waves. I’ll do the patinas in multiple shades again, to accent the trailing lines. The last whale piece isn’t quite finished. Needs refining. 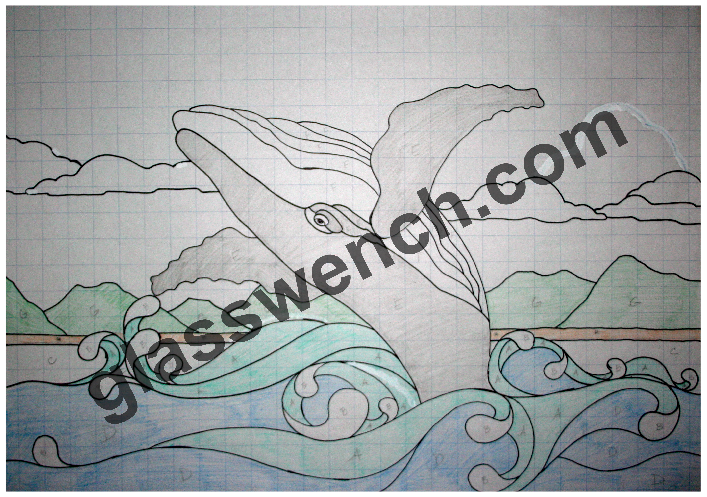 It is more realistic, and the aspect is from below, the whale is heading to the surface. I have this great glass, at least 35 years old, that I got from a neighbor when he moved. He said his mom did stained glass before she died. the glass was in a little hardsided case, all covered with dust. She passed 35 years ago, so it is at least that old. A dark grey with white, I think it will be gorgeous. I even had the local glass shop make me some warty bits to glue on the surface, to mimic the bumps along the snout and mouth of the whale. Going with a teal gluechip for the background, all one color. Going to try for a cool effect with this one. The top couple inches of the piece will represent the surface water, and I want it to look like it does when you see a film of a whale int he water. The last couple feet are churning, and multicolored and textured. So I am going to use several different colors and textures for that part. I hope to get a medalion (sp?) of a wave too, but the company is out of them, and doesn’t know if they will get any more in. Will have to wait and see. 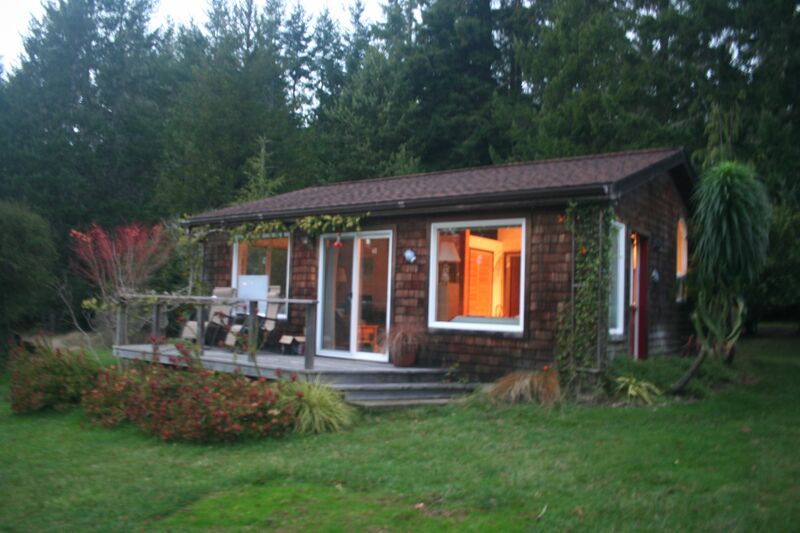 All in all, I am super pleased with the quiet cottage getaway. If you are looking for a little place on the coast of menodcino… check it out! ~ by kellig on February 1, 2011.